One of my favorite terms in French is amuse-bouche. The verb amuser means to entertain or amuse and the word bouche means mouth. An amuse-bouche is a small hors d’oeuvre served with an apéritif. The term makes me laugh because I imagine sleepy taste buds being teased and woken up in preparation of the meal to come. An amuse-bouche can be any number of munchies, from peanuts and bite-sized crackers, to olives and tiny decorated toasts called canapés. You can make canapés with many different kinds of bread. French grocery stores sell packages of miniature (about one square inch) pain de mie made specifically for this purpose. Pain de mie is the equivalent of sliced sandwich bread, soft and without a crispy crust. These slices come in a variety of different flours- white, whole wheat, rye, multi-grain… Or, you can do like Sébastien to get the same effect: take a traditional-sized piece of toast and cut it into quarters. Not everyone toasts their canapé bread, but we usually prefer it that way. If you want to be a little untraditional, do like me and cut a thin slice of your favorite freshly-baked loaf (for example, walnut or olive) and decorate that. If it’s still warm from the oven (which often happens when you live over a boulangerie) you may not even want to toast it. We’ve topped our toasts with all sorts of tantalizing toppings, such as herbed cheese with sliced cucumber, green olive tapenade and fresh garlic with olive oil and rosemary. 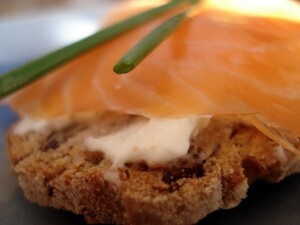 Our all-time favorite, however, is smoked salmon over a smear of butter or soft cheese. This one’s for the traditionalists. My mouth always starts watering when I smell the toasting bread and slightly melted butter. I won’t give you quantities or directions on how to put this together- it’s an easy one- just remember to let the toasts cool down a bit if you’re using cheese. Enjoy with your favorite apéritif! This entry was posted in Recipes (All) and tagged appetizers, cheese, fish. Bookmark the permalink. Sébastien’s version or Joy’s version that’s the (shakespearian) question ! But for a light “mise en bouche” Joy’s “amuse-gueule” version is better.